The beautiful Blue Ridge Mountains in which our Western NC Cabins are nestled is a fantastic place to visit. Families, groups of friends, couples, and even lone travelers love coming to our area to experience all of the fabulous Western North Carolina Attractions and the endless opportunities for outdoor recreation like Hiking North Carolina, North Carolina Fly Fishing, and sight-seeing at fantastic landmarks like Linville Gorge North Carolina, Linville Falls, and Linville Caverns NC. Though families love to visit our Linville Falls Lodging, our Rental Cabins Western NC are fantastic for romantic getaways, as well. With fabulous amenities and wonderful activities to participate in, our Western NC Cabins are perfectly suitable for NC Honeymoon Getaways. 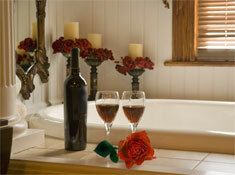 Spring, summer, fall, or winter, our Vacation Rentals in Western NC are the ideal location for your honeymoon. Whether you prefer the springtime when the wildflowers are in bloom, the warm weather of summer, the spectacular fall foliage, or the pristine snowfall that occurs during the winter months, our Cabins Hot Tub Western North Carolina are the perfect places to enjoy every season. Each of our Rental Cabins Hot Tub Western North Carolina are equipped with decks that boast hot tubs and charming views of the Linville River. What better way to spend a romantic evening than by taking a relaxing dip in the hot tub with your significant other? Our 32-inch flat screen TVs with DVD players create the perfect excuse to cuddle up on the couch and watch some TV—whether it be one of the more than 120 channels our Western NC Mountain Cabins Rentals have to offer or on the STARZ movie channel. Take advantage of our iPod radio cradles and set the mood with some romantic music, or take a moonlit stroll around the one-mile path that encompasses our Linville Gorge Lodging. Located in Pisgah National Forest, our Western North Carolina Cabin Rentals are secluded enough to provide the romantic atmosphere honeymooners crave, but are close to enough wonderful recreational opportunities to make them a prime destination for a NC Honeymoon Getaway. During the day, you’ll find a plethora of Western North Carolina Attractions to participate in, many of which are just a short drive from our Cabins on the Blue Ridge Parkway. How about a romantic excursion to Biltmore Estate Asheville, just fifty-seven miles from our Blue Ridge Parkway Cabins, where you and your significant other can marvel at the opulence of America’s largest privately owned home? Perhaps an eight-mile trip to Grandfather Mountain North Carolina would be more to you liking. There, you can gaze at spectacular scenery, view native animals in their natural habitats, and take a walk on the famed Mile High Swinging Bridge. Our Western NC Mountain Cabins Rentals are located in Pisgah National Forest and just two miles from the scenic Blue Ridge Parkway, so there are plenty of opportunities to enjoy the scenery and each other’s company while you explore the gorgeous area that surrounds our Rental Cabins Western North Carolina. Three fantastic Ski Resorts in North Carolina are within thirty-one miles of our Linville North Carolina Cabin Rentals Lake River Creek Pond, and are the ideal Linville Falls Lodging in which to spend a romantic NC Honeymoon Getaway in North Carolina’s ski country. Unforgettable Western North Carolina Attractions like Linville Falls, Linville Caverns NC, and Linville Gorge NC are all within close proximity of our Blue Ridge Parkway Cabins, and, as if all of these outstanding attractions were not enough, our Rental Cabins Western NC are also near some wonderful shopping and dining opportunities. With all of the comforts of home and all of the amazing activities that North Carolina has to offer within a short drive of our Linville Falls Lodging, our Western NC Cabin Rentals are the perfect places for a NC Honeymoon Getaway. With hot tubs on the decks of each of our Cabins Hot Tub Western North Carolina and the Linville River just yards away from our Western NC Mountain Cabins Rentals, you and your significant other will be delighted by both the atmosphere and the amenities of our Cabins Hot Tubs for Rent Western North Carolina. Our Vacation Rentals in Western NC are so full of fabulous amenities that you won’t even have to leave our Linville Falls Lodging during the entirety of your stay. But, if you choose to, you will be just minutes from some of the best Things to Do in Western North Carolina! Our Cabins on the Blue Ridge Parkway are the perfect places for you and your mate to spend your first days together as husband and wife.